Several diseases can result in disorders of bone mineralization in children, including rickets, renal diseases (renal osteodystrophy, Fanconi syndrome), tumor-induced osteomalacia, hypophosphatasia, McCune-Albright syndrome, and osteogenesis imperfecta with mineralization defect (syndrome resembling osteogenesis imperfecta [SROI]). Clinical results and laboratory examination findings vary with each disorder. Low phosphate and high alkaline phosphatase levels characterize most of the disorders. Exceptions are noted in the discussion of each disorder. The primary absorption site for vitamin D is the jejunum. The 2 main sources of vitamin D in humans are vitamin D3 (cholecalciferol), produced by the skin after ultraviolet (UV) radiation (290-320nm) – dependent conversion of 7-dehydrocholesterol, and dietary intake of either vitamin D2 (ergocalciferol) or vitamin D3. Both forms of vitamin D have identical biologic actions. The initial step in the metabolic activation process is the introduction of a hydroxyl group at the side chain at C-25 by the hepatic enzyme, CYP 27 (a vitamin D-25-hydroxylase). The products of this reaction are 25-(OH)D2 and 25-(OH)D3, respectively. Further hydroxylation of these metabolites occurs in the mitochondria of kidney tissue, catalyzed by renal 25-hydroxyvitamin D-1α-hydroxylase to produce 1α,25-(OH)2 D2 (activated vitamin D2 or 1,25[OH]2 D2), the primary biologically active form of vitamin D2, and 1α,25-(OH)2 D3 (calcitriol or 1,25[OH]2 D3), the biologically active form of vitamin D3. Of note, the kidney generates at least 30 other vitamin D metabolites, but their biologic significance is not clear. The pathophysiology of rickets is not completely understood, nor is the role of the many vitamin D metabolites. Calcitriol levels may be normal in patients with rickets, suggesting that it is not the only active form of the vitamin. Causes of rickets related to phosphate deficiency are discussed in the article Hypophosphatemic Rickets. Calcification of osteoid depends on adequate levels of ionized calcium and phosphate in the extracellular fluid. Vitamin D influences these levels after its dihydroxylation into calcitriol (at the 25 position in the liver and the 1 position in the kidney). If the enzyme that controls either of these steps is deficient because of a mutation, vitamin D function is less than normal. In addition, a renal tubular defect that reduces reabsorption may alter phosphate metabolism. Finally, a genetic absence of the receptor for calcitriol results in deficient calcification. In patients with oncogenic osteomalacia, intact and C-terminal fibroblast growth factor-23 (FGF-23) levels are elevated, and the tumors responsible for this disease show increased expression of FGF-23 messenger ribonucleic acid (mRNA). A recommended daily allowance (RDA) for vitamin D has not been defined. Because no strong data support an RDA, recommendations for vitamin D intake actually refer to "adequate intake." Dietary rickets can be a consequence of inadequate intake of calcium, vitamin D, phosphate, or a combination of these. Infants fed exclusively with mother's milk can develop nutritional rickets because of the low content of vitamin D in breast milk (4-100 IU/L). In premature infants, insufficient amounts of calcium and phosphorus may cause nutritional rickets. Furthermore, reserves of vitamin D in the neonate highly depend on the mother's vitamin D status. Infants with low or no sun exposure may develop rickets, particularly if they have dark skin, because of decreased vitamin D production by the skin after exposure to UV light. Maternal hypovitaminosis D may cause congenital rickets in infants. Radiologic features include widening of the epiphysial plate, cupping, and deformities in the shaft of long bones. Of note, radiographs of the costochondral junction are not useful in the diagnosis of rickets. The healing process is characterized by broadened bands of increased density. Different treatment modalities are available for nutritional rickets. Oral doses of 5,000-15,000 IU/day of vitamin D for 4 weeks are generally safe and effective. If compliance cannot be assured, 100,000-500,000 IU can be given orally or intramuscularly every 6 months or 600,000 IU may be given in a single intramuscular dose. Calcium intake must be optimized at the same time. Calcium, phosphorus, and parathyroid hormone concentrations should normalize within 1-3 weeks. Radiologic lesions and clinical symptoms improve rapidly with treatment, although alkaline phosphatase levels may remain elevated for several months after radiologic resolution. Also known as vitamin D–pseudodeficiency rickets (PDDR), this disorder results from a genetic deficiency in the enzyme that converts calcidiol to calcitriol in the kidney. Inheritance is autosomal recessive, and the gene is located in band 12q13.3. Clinical and laboratory examination findings are similar to those associated with nutritional rickets, with low levels of 1,25(OH)2 vitamin D.
Levels of 1,25(OH)2 vitamin D may be normal but inadequately low for the levels of calcium, phosphorus, and parathyroid hormone. These patients develop rickets despite receiving vitamin D at the recommended preventive doses. Medical treatment consists of oral calcitriol (0.5-1.5mcg/day). These patients may also respond to pharmacologic doses of vitamin D (5,000-10,000U/day). Receptor defect rickets (hereditary 1,25-dihydroxyvitamin D–resistant rickets [HVDRR]) results from a recessively inherited abnormality in the calcitriol receptor, causing an end-organ resistance to the vitamin. The clinical picture, which is evident early in life, consists of rickets with very severe hypocalcemia and alopecia, although a variant without alopecia has been reported. Patients without alopecia appear to respond better to treatment with vitamin D metabolites. Serum levels of 1,25(OH)2 vitamin D3 are typically elevated. HVDRR can be lethal in the perinatal period. Because calciferol receptors are in many tissues, other, more subtle dysfunctions may occur. Patients are hypocalcemic and usually normophosphatemic. Several mutant forms of receptor defect rickets are recognized, with a wide range of severity and response to calcitriol therapy. Some patients are totally resistant to therapy. Some others have benefited from intravenous calcium (400-1400mg/m2/day) followed by oral therapy with high doses of calcium (with secondary risk of nephrocalcinosis, hypercalciuria, nephrolithiasis, and cardiac arrhythmias). Patients with mutations in the ligand-binding domain (LBD) region of the receptor are more likely to respond to high-dose vitamin D treatment than are patients with mutations in the deoxyribonucleic acid (DNA)–binding domain (DBD) region of the receptor. Two cases of 25-hydroxylase deficiency have been reported, one involving a family in the United States and the other involving a family in Germany. Inheritance is likely autosomal recessive. The clinical picture resembles that observed in nutritional rickets, with a later age of onset. Treatment with calcidiol in physiologic amounts is sufficient for this condition. Calcidiol is a natural metabolite of vitamin D. Calcidiol is hydroxylated once at the 25 position and is the circulating form for vitamin D in plasma. Several different familial and acquired conditions may lead to hypophosphatemia in children. In familial hypophosphatemia, the kidneys fail to reabsorb sufficient phosphate, leading to low levels of serum phosphate. This is usually evident only after age 6-10 months. Prior to this occurrence, the glomerular filtration rate is low, which sustains an adequate phosphate level. Once renal maturity is reached, phosphate levels are usually less than 3.5mg/dL and are often less than 2.5mg/dL. Levels of 1,25(OH)2 vitamin D are actually normal in these patients, owing to an abnormal response to hypophosphatemia, in which levels of 1,25(OH)2 vitamin D should increase. Mutations in PHEX and DMP1 result in X-linked hypophosphatemic rickets and autosomal recessive hypophosphatemic rickets, respectively. (Most families of patients with familial hypophosphatemia exhibit X-linked dominant inheritance.) PHEX, a phosphate-regulating gene, codes for a protease, which is an enzyme that catalyzes the hydrolysis of a protein. Degradation of MEPE and DMP-1 and release of ASARM peptides are chiefly responsible for the hypophosphatemic rickets mineralization defect and changes in osteoblast-osteoclast differentiation. FGF-23 has been implicated in the renal phosphate wasting in tumor-induced osteomalacia and autosomal dominant hypophosphatemic rickets. Mutations in the gene that codes for the main renal sodium-phosphate cotransporter (NPT2a) have been reported in some patients with familial renal calcium stones and hypophosphatemia due to a decrease in renal phosphate reabsorption. These patients have hypercalciuria and elevated levels of 1,25(OH)2 vitamin D3. Autosomal recessive and autosomal dominant inheritance have each been found and have been associated with the same clinical phenotype. In approximately one third of patients, the disease appears to occur as a consequence of a new mutation. Clinical findings are similar to those of nutritional rickets, but without proximal myopathy. These patients usually have high bone density. As hypophosphatemia is usually clinically evident at a later age, infantile skull defects are not apparent. Because calcium levels remain normal, neither tetany nor secondary hyperparathyroidism are present. Optimal therapy consists of oral phosphate to provide 1-3g of elemental phosphate per day in 5 divided doses plus oral calcitriol (0.5-1.5mcg/day). Calcitriol (Rocaltrol) prevents increases in parathyroid hormone caused by phosphate therapy. The phosphate mixture contains mineral salts of phosphoric acid. Raising the concentration of plasma phosphate facilitates calcification of osteoid. Of note, phosphate half-life in serum is short, which usually causes low phosphate levels in fasting serum samples, despite proper therapy. Efficacy is reflected by proper linear growth. Minor changes in calcitriol dose may produce hypercalcemia and renal damage. The calcium-creatinine (mg/mg) ratio in urine must be closely monitored at first and then every 3-6 months. An elevated phosphate intake may produce secondary hyperparathyroidism. Therefore, only experienced practitioners should treat these patients. Different medications may affect bone in different ways. Chronic anticonvulsant therapy (particularly with phenobarbital and phenytoin) may cause rickets, regardless of appropriate vitamin D intake. The main mechanism is related to induction of hepatic cytochrome P-450 hydroxylation, generating inactive metabolites. Levels of 25-hydroxyvitamin D3 were reported to be low in children on long-term anticonvulsant therapy. Fractures were associated with the use of anticonvulsants in patients with cerebral palsy. A down-regulation of 25-hydroxylation by phenobarbital may explain, at least in part, the increased risk of osteomalacia, bone loss, and fractures associated with long-term phenobarbital therapy. Conversely, calcitriol levels in plasma are reportedly not low in patients taking medication for seizures. The dose of vitamin D required to prevent this type of rickets is unclear. Supplementation may not be needed. Approximately 800-1000 IU/day, plus good calcium intake, may be sufficient. Lowe disease and Dent disease are familial forms of Fanconi. Two different genes have been identified as being involved in the development of Dent disease. CLCN5 is affected in Dent disease type 1 and OCRL1 is affected in Dent disease type 2. Other genes may also be involved, because mutations in CLCN5 and OCRL1 are not found in some patients. In Fanconi syndrome, which includes cystinosis and tyrosinemia, renal phosphate wasting may occur, along with aminoaciduria and glycosuria. Fanconi syndrome can have a genetic cause (as in Lowe and Dent disease), or it may be acquired from various toxins, including heavy metals (eg, mercury, lead) and drugs. The clinical picture varies with age and cause and includes severe hypophosphatemic rickets, failure to thrive, and metabolic acidosis. A potential drug-induced Fanconi syndrome has been noticed in children treated with ifosfamide, a derivative of cyclophosphamide. 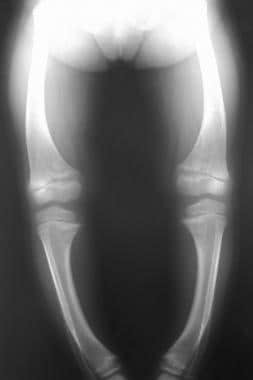 The syndrome presents with radiologic changes compatible with rickets. Most patients respond to a combination of managing the underlying cause when possible and vitamin D therapy. These patients do not necessarily appear to require treatment with calcitriol. Renal tubular acidosis, through phosphate wasting, may also cause rickets. In end-stage renal disease, renal 1-hydroxylase is diminished or lost, and excretion of phosphate is defective. This leads to low levels of 1,25(OH) 2 vitamin D, hypocalcemia, and failure of osteoid calcification. Osteodystrophy (ie, renal rickets) is the only type of rickets with a high serum phosphate level. It can be adynamic (a reduction in osteoblastic activity) or hyperdynamic (increased bone turnover). Calcium receptors (CaRs) have been discovered in bone, kidney, and intestine and also in organs not directly related to calcium regulation. Mutations that cause loss of function in the CaRs result in familial benign hypocalciuric hypercalcemia and neonatal severe hyperparathyroidism. Familial benign hypocalciuric hypercalcemia is usually associated with heterozygous inactivating mutations of the CAR gene, whereas neonatal severe hyperparathyroidism is usually due to homozygous inactivation of the CAR gene. Familial benign hypocalciuric hypercalcemia is generally asymptomatic and is characterized by mild to moderate, lifelong hypercalcemia; relative hypocalciuria; and normal intact parathyroid hormone. Individuals with neonatal severe hyperparathyroidism frequently develop life-threatening hypercalcemia. Treatment of these patients includes phosphate binders, a low phosphate intake, and calcitriol and other vitamin D analogs. Tumor-induced osteomalacia (TIO) is a paraneoplastic syndrome with hypophosphatemia secondary to decreased renal phosphate reabsorption, normal or low serum 1,25-dihydroxyvitamin D concentration, osteomalacia, and myopathy. Several mesenchymal tumors of bone or connective tissue (including nonossifying fibromas, fibroangioma, and giant cell tumors) secrete a phosphaturic substance (parathyroidlike protein) that results in rickets. The age of onset has been late childhood, adolescence, or young adulthood. The clinical characteristics are similar to those associated with familial hypophosphatemia. FGF-23 causes renal phosphate wasting in tumor-induced osteomalacia. Treatment is surgical removal of the tumor (if it can be located), with excellent results. This autosomal recessive condition, which results in low activity of the tissue-nonspecific isoenzyme of alkaline phosphatase (TNSALP), causes rickets without disturbance of calcium and phosphate metabolism. Levels of TNSALP substrates, namely pyridoxal-5'-phosphate (PLP), inorganic pyrophosphate (PPi), and phosphoethanolamine (PEA) in serum and urine, are increased. Clinical severity widely varies, ranging from death in utero to pathologic fractures first presenting only in adulthood. Six clinical forms of hypophosphatasia have been distinguished, although form assignment may be challenging in some cases. 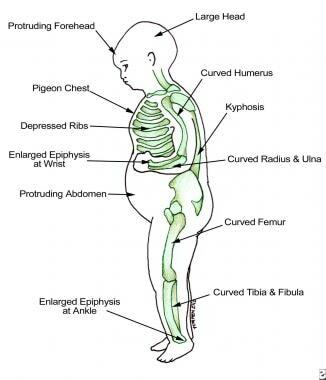 This classification is based on the age at which skeletal lesions are discovered: perinatal (lethal), infantile, childhood, and adult. Two particular forms include odontohypophosphatasia (only biochemical and dental manifestations are present, with no clinical changes in long bones) and pseudohypophosphatasia. The effects of bone marrow transplant in hypophosphatasia are transient, and bone lesions may recur 6 months after the transplant. Nonsteroidal anti-inflammatory drugs (NSAIDs) have been used in patients with childhood hypophosphatasia with some clinical improvement. Patients with McCune-Albright syndrome may have hypophosphatemia secondary to urinary phosphate leak, which may cause osteomalacia. Fasting phosphate levels should always be monitored in these patients, and phosphate supplements prescribed when indicated. Syndrome resembling osteogenesis imperfecta (SROI) with mineralization defect is clinically indistinguishable from moderate to severe osteogenesis imperfecta. (This rare form, in fact, has been termed type VI osteogenesis imperfecta.) It can only be diagnosed with bone biopsy, in which a mineralization defect that affects the bone matrix and sparing growth cartilage are evident. These patients have neither dentinogenesis imperfecta nor Wormian bones. Despite the histologic mineralization defect, no radiologic signs of growth plate involvement are seen. The pattern of inheritance is not clear, but a case of 2 siblings from healthy consanguineous parents has been described, suggesting gonadal mosaicism or a somatic recessive trait. No mutations of COL1A1 and COL1A2 genes have been found in these patients, and collagen structure appears to be normal. This form shares several characteristics with fibrogenesis imperfecta ossium. A mild, rare form of this condition may occur (3 patients in a series of 128 bone biopsies performed to assess bone fragility). These patients do not appear to respond well to treatment with intravenous bisphosphonates. Martin A, David V, Laurence JS, et al. Degradation of MEPE, DMP1, and release of SIBLING ASARM-peptides (minhibins): ASARM-peptide(s) are directly responsible for defective mineralization in HYP. Endocrinology. 2008 Apr. 149(4):1757-72. [Medline]. Vieth R, Fraser D. Vitamin D insufficiency: no recommended dietary allowance exists for this nutrient. CMAJ. 2002 Jun 11. 166(12):1541-2. [Medline]. Chapman T, Sugar N, Done S, Marasigan J, Wambold N, Feldman K. Fractures in infants and toddlers with rickets. Pediatr Radiol. 2009 Dec 9. Epub:[Medline]. Tencza AL, Ichikawa S, Dang A, et al. Hypophosphatemic rickets with hypercalciuria due to mutation in SLC34A3/type IIc sodium-phosphate cotransporter: presentation as hypercalciuria and nephrolithiasis. J Clin Endocrinol Metab. 2009 Nov. 94(11):4433-8. [Medline]. [Full Text]. Henderson RC, Lin PP, Greene WB. Bone-mineral density in children and adolescents who have spastic cerebral palsy. J Bone Joint Surg Am. 1995 Nov. 77(11):1671-81. [Medline]. Hosseinpour F, Ellfolk M, Norlin M, Wikvall K. Phenobarbital suppresses vitamin D3 25-hydroxylase expression: a potential new mechanism for drug-induced osteomalacia. Biochem Biophys Res Commun. 2007 Jun 8. 357(3):603-7. [Medline]. Prie D, Huart V, Bakouh N, et al. Nephrolithiasis and osteoporosis associated with hypophosphatemia caused by mutations in the type 2a sodium-phosphate cotransporter. N Engl J Med. 2002 Sep 26. 347(13):983-91. [Medline]. FDA approves new treatment for rare metabolic disorder. U.S Food & Drug Administration. Available at https://www.fda.gov/NewsEvents/Newsroom/PressAnnouncements/ucm468836.htm. October 23, 2015; Accessed: March 28, 2017. Whyte MP, Madson KL, Phillips D, Reeves AL, McAlister WH, Yakimoski A, et al. Asfotase alfa therapy for children with hypophosphatasia. JCI Insight. 2016 Jun 16. 1 (9):e85971. [Medline]. Plotkin H. Syndromes with congenital brittle bones. BMC Pediatr. 2004 Aug 31. 4:16. [Medline]. ADHR Consortium. Autosomal dominant hypophosphataemic rickets is associated with mutations in FGF23. Nat Genet. 2000 Nov. 26(3):345-8. [Medline]. Anatoliotaki M, Tsilimigaki A, Tsekoura T, et al. Congenital rickets due to maternal vitamin D deficiency in a sunny island of Greece. Acta Paediatr. 2003. 92(3):389-91. [Medline]. Chesney RW, Zimmerman J, Hamstra A, et al. Vitamin D metabolite concentrations in vitamin D deficiency. Are calcitriol levels normal. Am J Dis Child. 1981 Nov. 135(11):1025-8. [Medline]. Intakes SCotSEoDR. Dietary reference intakes: calcium, phosphorus, magnesium, vitamin D, and fluoride. Washington, DC: National Academy Press; 1997. Juppner, H. Novel regulators of phosphate homeostasis and bone metabolism. Ther Apher Dial. 2007. 11:S3-S22. [Medline]. Plotkin H, Lifshitz F. Rickets and osteoporosis. Lifshitz F, ed. Pediatric Endocrinology. 5th ed. 2006. Disclosure: Received salary from PPD, Inc for: PPD.